Does this look like your kind of party? Hello PCF! First I would like to say thank you for everyone who have been coming out to track night. I hope you are having as much fun in class as I am when I teach it! As you know, Paradiso Crossfit would eventually like to become an official Crossfit Endurance team, and there is no better way towards that goal than to get people to sign up for a major race and start training! Well that time is now. 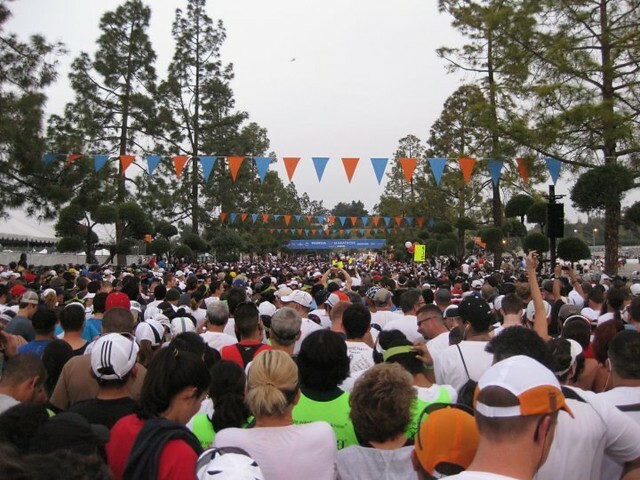 The 27th annual Honda LA Marathon will take place on Sunday March 18th, 2012, and is exactly 6 months away! Check out this video for a description of the Stadium to the Sea route, which begins in Dodger Stadium and ends at the Santa Monica Pier. The route highlights some of the nicer neighborhoods in LA and is a great way to experience the landmarks of the Westside. Down to business. Starting next Monday, track night will begin a training program geared towards preparing you for the LA marathon. It will start with a 12 week On-Ramp cycle to progress you safely into the CFE program. During this time you will also become proficient in the POSE method. That will end on December 6th, at which point it is recommended to run a shorter training race, preferable a half marathon. There are tons of half marathons and 10ks in Los Angeles/California to choose from in December. After New Years break, track night will resume with a 10 week RX cycle to round off the training. Both cycles are 2-3x run WODs coupled with 4-6x CF WODs per week. That means 8 hrs or less of total training and 10 miles or less of total running per week. The focus here is on recovery! We want you fast, efficient, but most importantly, HEALTHY and ready to go on race day! To make sure you completely dominate this race, we will focus on nutrition, hydration, mobility, and POSE method to ensure recovery during training. We will also address race day nutrition and hydration which can play a major role in running a successful race. How do you calculate race day hydration you ask? Weigh yourself before and after workouts to see how much weight you lose in sweat, and calculate water and electrolyte needs from there. Yes, we are not going to leave anything to chance come March 18th. In 2009 I felt fine up to mile 20 until I hit “the wall”. I had absolutely no energy left and had to muster every ounce of will power just to get myself to a jog. It was the single greatest test of will power I have ever encountered. I did not eat nearly enough or take in any salt or electrolytes during the race, and I have no doubt in my mind that is the reason why I failed that day. It will not happen again ?. So think about using PCF to train for this year’s marathon. If you are already crossfitting regularly, than the program will only add 2x more workouts to your week. Committing to an event also brings purpose to your training and will force you to be consistent and address your weaknesses. If you think you cannot complete a marathon, you are wrong. The program is completely scalable (the needs of Olympic athletes and our grandparents differ by degree not kind, remember?) and if you go watch any marathon I guarantee you will see a 70+ year old grandmother completing the race. You are in better shape than that woman and have a better training program at your fingertips! If you are already signed up for the marathon and training LSD, come check out the program to see if it can meet any of your needs in a better way. Let me know if you have any questions, and I hope to see you out there! Editors’ note: There will be a discussion and Q&A with Frank about the program, following class this Monday night. For all of you interested in the program, check out the class and get your questions answered! This does not mean that you will need to be running the marathon to attend the class. If you have ever wanted to run a marathon, this is your chance! How much worse could it be than my experience?